One of the most popular ways many content publishers are incorporating real-time content into their production schedule is by hosting live chats with experts, celebrities and other notable guests. But how do you keep your content and topics fresh, consistently land awesome guests and cultivate the community you need? Our panelists this week will share their tips and tricks from their collective chat-hosting experience. And yes, we realize the meta nature of this chat. As such, our panelists will answer any questions you may have as well. Submit them in the comment box here. Because the barriers to content production are lower than ever, and because platforms like Scribble can help you solicit the all-important user engagement, live chats are an obvious choice to bring content producers and consumers together. I think today's panel demonstrates the range of content producers that can use live chats and Q&As to connect with their audiences, build their communities, expand their brand reach and get expert or celebrity presence on their site: We have presence from media, from a personal finance publication and from a niche social network. All of these different types of content creators have the same goal: To host people and create content that their respective audiences want to engage with. That all said, my first question to you all: What are your goals around events such as these, and how have you found that live chats help you achieve these goals? In terms of goals, I’m always looking for ways to engage our readers by providing opportunities via live chat for them to connect with interesting people. It could be information that’s useful, like understanding tax-free savings accounts, or it could be a chance to hear expert opinions about something already in the news, like the royal baby, or it could be just for fun — who doesn’t want to talk to a zombie from the Walking Dead? And the real-time format makes it even more compelling...you never know what someone might say, or the direction the conversation will go. Our goal at Fishidy has always been to connect with our members on a personal level. I think the live chat events we've run have brought a level of transparency to our company. We want our members to know we are just like them. 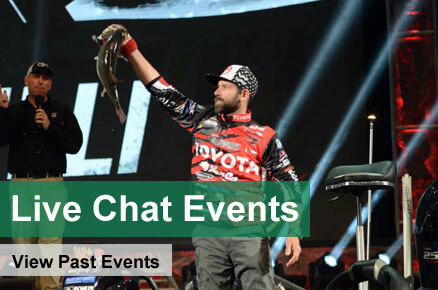 We're as excited to get out and fish, and have the chance to chat with a pro bass fisherman like Mike Iaconelli as much as they are. It builds trust. Also, though I'll always be a big fan of Twitter chats, live chats like this one are much easier to follow! That's so true, Rebecca. I love it when we can feature our own journalists on our chats...it's a great way to bring readers onto the front lines of a story. Exactly, Ruth. And, I think it's also a great way for our journalists to get a chance to share the wealth of information that doesn't always make it into print. I think it's really cool that the three of you work at different places but have the same ideas when it comes to why you run live chats. So, that broad question now out of the way, let's get into some nitty gritties when it comes to running a good live chat. Ruth, this one might apply more to you -- but when you're consistently running chats (Ruth is hosting her 300th this week! 300!) how do you keep your content fresh and choose topics that will keep your audience engaged? For Rebecca and Jon, how do you go about choosing guests that will be relevant and valuable to your readers and users? Wow! Well, we may not be close to 300 yet, but we try to peg our chats to major events. For instance we could do a Q&A with our tax experts when tax season rolls around. On Thursday we're actually hosting a Financial Planning for College chat, since it's about time to think about heading back to school. I base my topics on what people are talking about, in person and online and I try to provide a mix of topics each week. We also have a few consistent chats. For example, we have a weekly wine chat. It could just be a free-for-all each week, but we focus it on a specific aspect of wine, so we might discuss rosé one week or bargain wine another week so it’s always a new topic. We keep all our regular chats fresh with special guests, too. When we talked about Downton Abbey on our TV chat, we brought on a British historian to discuss with our TV critics. When we discussed the Walking Dead, we had one of the zombies from the show on with us. Our food chat regularly features guest panelists: cookbook authors, chefs etc. For our Jump Start Your Financial Plan with NAPFA chats, we actually get our experts from NAPFA's rolodex of personal financial advisors. Otherwise, as I mentioned before, we usually call on our incredibly knowledgable in-house reporters. In our case, as a fishing social network, we've built a great relationship with one of the most popular pro bass fisherman on the tournament trail these days. Mike Iaconelli is known for being a little unconventional, and maybe even a rebel in the traditional sport of fishing. He's a quick thinker (and a quick typer) who always has something different on his mind. Ruth and Rebecca, this is something you've both mentioned now. Do you find that your readers enjoy interacting more with experts you bring in, or your in-house journalists? Hmm. I honestly can't say that I've noticed people favoring one group over another since they talk about different sorts of topics. I'm not sure there's a difference for the reader...I bring in our journalists who are already recognized experts in the particular topic anyway. For example, for our chat about the royal baby, we had a royal historian and other royal experts but we also had our foreign correspondent in London, Matthew Fisher, who was covering the story. Readers were interested in his perspective, too, in part because the story was not just about the baby, but about the tremendous public interest in the story, which was something Matthew could see first hand. I ask that to you guys because it seems that these sorts of live chats can mirror more traditional media, such as political commentary television shows where there are experts or pundits sitting on a panel with a journalist, who brings a more balanced perspective. Next up, a question from a reader. Hi everyone. I'd like to know about the promotion of your events. How do you make sure your audience knows about your chats? Do you use social networks to draw people in – and if so, how so? We created a hashtag (#ScribbleChat). Our brand tweeted it, I tweeted it, my coworkers tweeted it and some of you guys even did! We also syndicated this chat to some Scribble clients who are interested in new trends in media and content creation. What other kinds of things do you guys suggest doing to get word out? In addition to social media, we feature the chat prominently on the Kiplinger.com homepage when there's one coming up. And, we give it a nod in the newsletter. We absolutely use social media to our advantage! We've promoted our live chat events events with special guests out a minimum of a week ahead of time using Facebook, Twitter, Google +, etc. Hi Allendria. I promote our chats via Twitter (@PostmediaChats) and my colleagues across the Postmedia network also promote via their own social networks. Depending on the topic, I will reach out to certain groups directly. We also have a central hub that features all our chats in one place: www.canada.com/chatcentral. I also use Facebook to promote. We've also created banner-ad like content on our own website so that when members login, they see the banner that advertisers the date/time of the event, and sign-up. Something else I like to do is to open the chat room about 24 hours before it's about to start to allow people to post questions in advance. I think it gives a little more incentive to come back when the chat is actually live. Great words of wisdom! I love the stuff about homepage promotion—after all, if a chat happens and nobody knows about it, does it really exist? You guys all mentioned promoting chats well ahead of time. What else do you do to get ready for these chats in advance? At a minimum we tend to prepare a few opening questions ahead of time if we run into a situation where chatters are a little hesitant at first to begin asking questions. Once a couple questions get kicked-off, the conversation usually picks up and then it's just a matter of managing the Q&A at a fair pace. Preparation, for me, really depends on the subject. We do chats on all topics, and some I’m more comfortable with than others, so that dictates the amount of preparation I need. You can never predict audience participation, though, so I always have lots of questions ready before I go into a chat and I always try to make sure I’ve read up as much as I can on the topic at hand. But for breaking news topics, that’s not always possible – but that’s also what makes it exciting for us and for the readers. Ditto what Jon said. I personally like to look back through Facebook comments and Tweets to see what sorts of questions people are looking to answer. I make a note of those to use as stock questions if things ever get slow. But, re engagement, I always give preference to reader questions in our chats, so I often don’t use the questions I’ve prepared. I also look for related content on www.kiplinger.com that I can share during the chat to supplement the experts' information. Is there a sweet spot for number of participants in a live chat? I imagine things could easily get out of control with too many cooks in the kitchen. Do you have any tips for dealing with really busy chats? Hi guys. Question is for Ruth: what was it like to moderate Justin Bieber's mom's chat. Was that the craziest (most busy one) you guys had? Share any funny moments? Learn anything from it?